By 2030, the greenhouse effect and other causes will have raised the average world sea level by 1 meter from its 1994 level. The web page http://climate.nasa.gov/vital-signs/sea-level/ retrieved 6 Feb 2017 includes a summary of sea level measurements starting in 1993. 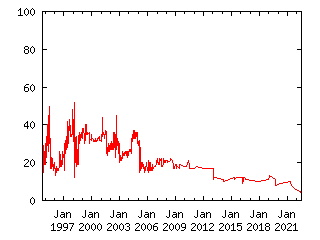 At 1994.0196533 the sea level was -8.28 mm relative to a reference value calculated over 1993-2001. I plan to use this as the 1994 benchmark for the purposes of judging this claim. The latest sea level shown on this chart as of 6 Feb 2017 is 67.07 mm for 2016.7419434, corresponding to an increase of 75.35 mm over the reference value.